Just in case the last couple posts have made you think that I am all about being green and healthy, I give you this decadent cake recipe. Green is only part of St. Patrick’s day celebrations. The other part being composed of beer and whiskey, and this cake contains both! For the cake, I encourage you to use your favorite stout. 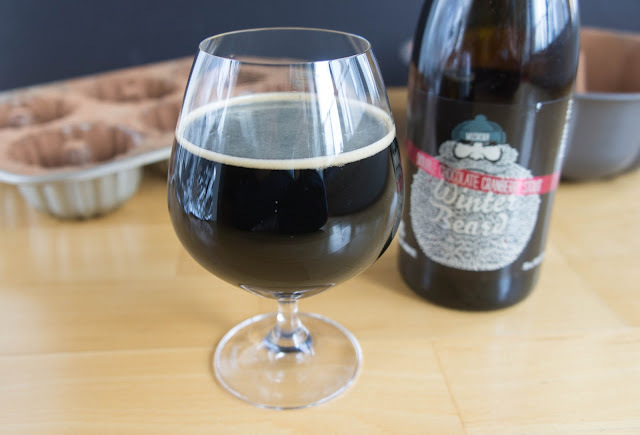 I chose a chocolate cranberry stout from the Muskoka Brewery called “Winterbeard”. It may be partially the funny picture on the front of the bottle that gets me, but the taste is deep, rich, and bitter, with a hint of sweetness and acidity from the chocolate and cranberry. My favorite part of this cake recipe is the addition of finely chopped chocolate at the end. This creates these little pockets of gooey melty chocolate when the cake comes out of the oven. It may cause you to eat one third of the cake straight from the pan while standing over the stove. This is normal. The glaze is just white chocolate, cream, and whiskey. I love the way it runs in little waterfalls down the sides of the cake and pools at the bottom. I would swim in those pools. So make this cake and happy St. Patty’s day! Prepare your pans. 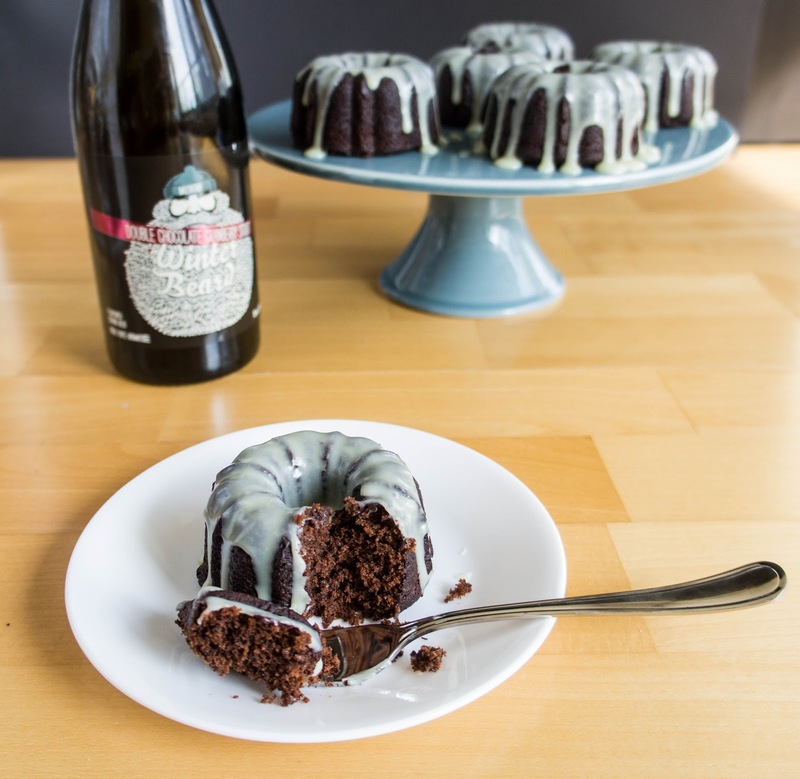 This recipe makes one large bundt cake or 12 1-cup mini bundt cakes. If you’re like me and only have a 6 mini bundt pan, then just put the rest in another pan. I just filled my regular bundt halfway and they baked for the same amount of time. Butter your pans and coat with cocoa powder. Really make sure that all the crevices are buttered and coated as this cake will stick! In a small saucepan over medium-high heat, bring stout and molasses to a simmer, so that the molasses are fully dissolved. Remove from heat and set aside. In a medium bowl, sift together the flour, cocoa powder, baking powder, baking soda, and salt. In a large bowl with an electric mixer or in the bowl of your stand mixer, cream the butter on medium speed until smooth. Add brown sugar and cream together for about 3 minutes. Beat in the eggs one at a time, scraping the side of the bowl with a rubber spatula between each addition. With the mixer on low, alternate flour mixture and stout mixture beginning and ending with flour waiting until each addition is well incorporated before adding the next. Scrape down the sides of the bowl as necessary to ensure even mixing. Stir in chopped chocolate. 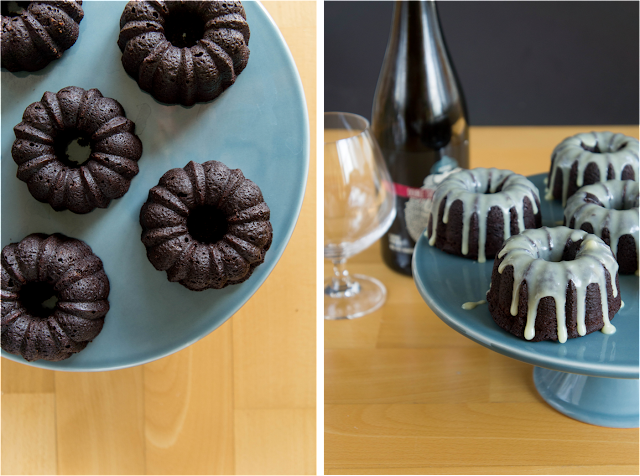 Pour batter into prepared pan(s), filling each mini bundt mold about 3/4 of the way. 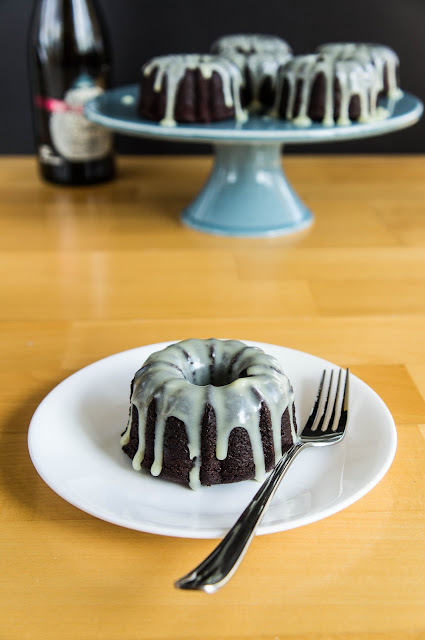 Bake in the center of the preheated oven for 45-50 minutes for a large bundt or 35 minutes for the minis or until a toothpick inserted in the center comes out with a few moist crumbs. Let cool on a rack in the pan for 20 minutes. This is important, if you let it cool in the pan all the way it may break apart when you try and remove it. You want it to still be warm. After 20 minutes, invert the cake(s) onto a rack and let cool until just slightly warm. Then glaze. 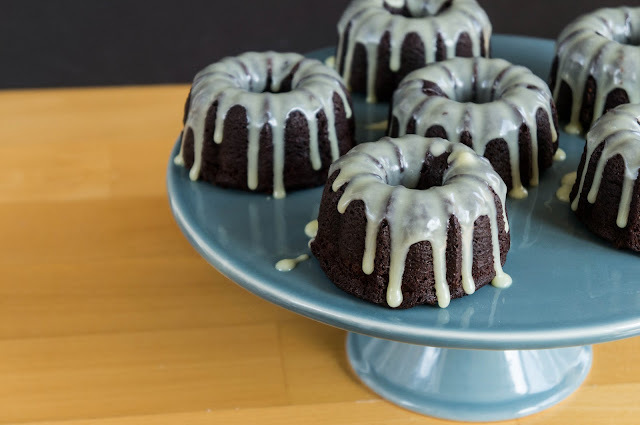 If you're not glazing right away, wrap the just warm cakes well in plastic wrap and they will keep for a week at room temp or for a month frozen. Melt white chocolate and cream gently over a double boiler. Remove from heat and stir in whiskey. Let cool until slightly thickened. Pour over slightly warm cakes. I like it to just pour it over the top of the cake and let it leak down the sides as it will.